If you’re in need of a camera backpack suited to city life, you’ve come to the right place. Getting all of our gear safely and securely from point a to point b is always a top priority. 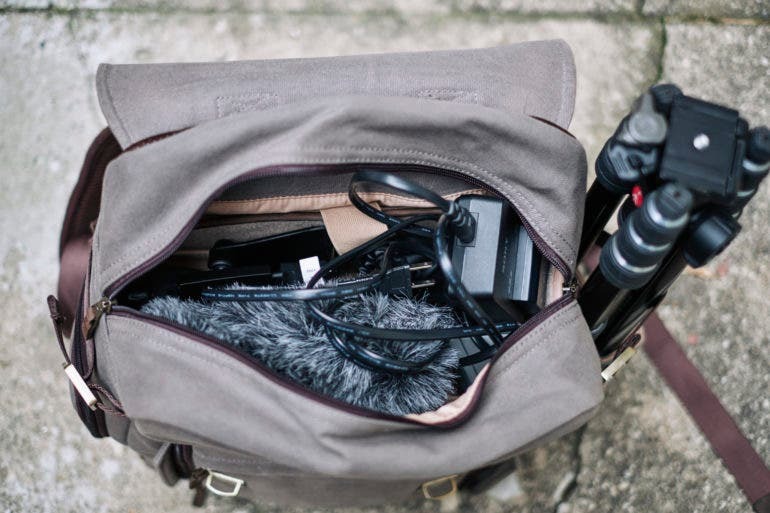 We sometimes carry thousands of dollars worth of equipment, so our camera bags have to be sturdy and secure. 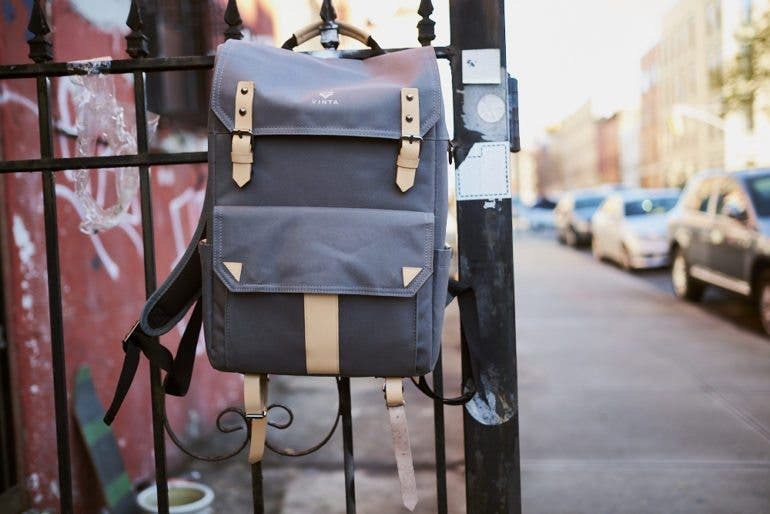 A camera backpack offers the perfect way to carry your gear around the city. The backpacks we’ve chosen are tough, they have low profiles, can withstand the weather, and they can carry a ton of gear. Best of all, the bags we’ve chosen are all under $300! If you feel like you need a new camera backpack in your life, you owe it to yourself to check out the bags we have listed below. They’re outstanding value for money, they’re all incredibly stylish, and they’ll get your gear to your destination in one piece. 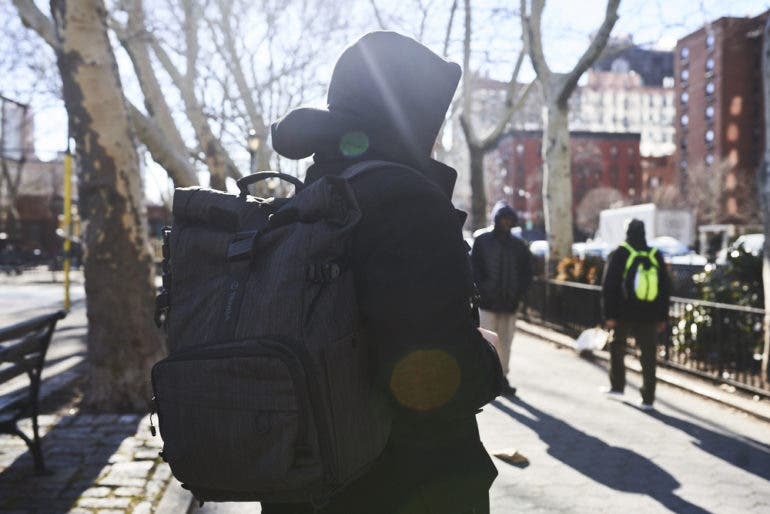 See our five picks backpack picks for city dwellers. 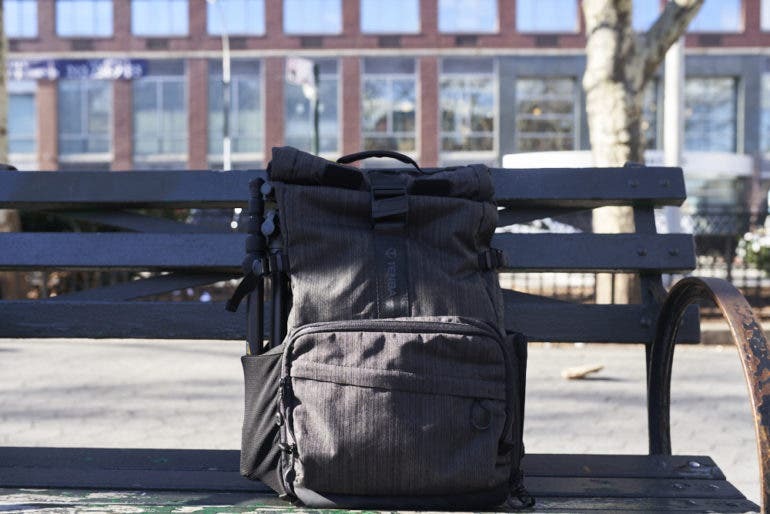 The first backpack for city dwellers on our list is the Tenba DNA 15. This bag is quite unique thanks to its roll-top design which allows you to make the bag as large or small as you like; handy for when you’re getting onto cramped public transport. The Tenba DNA 15 is also weather sealed, and it can carry a ton of gear. The Tenba DNA 15 has plenty of room for a Mirrorless or DLSR camera along with four to six lenses in the main compartment. 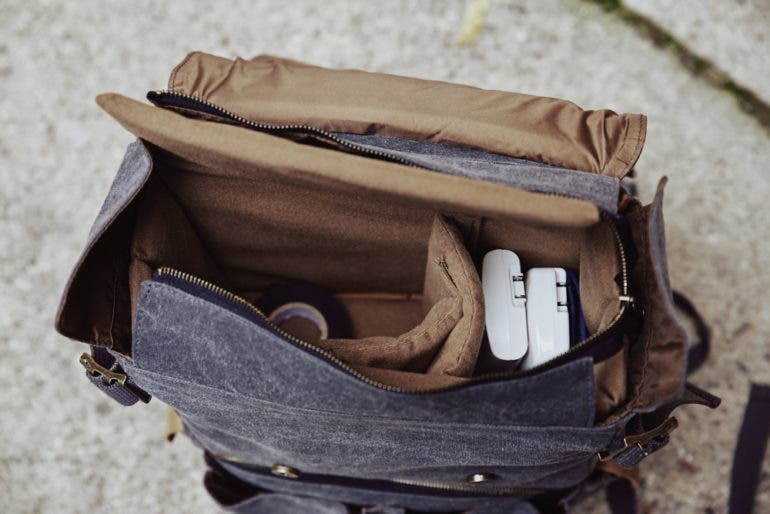 The top of the bag, when rolled open, reveals a deep storage area perfect for a change of clothes, a drone, or lighting gear such as a rechargeable monolight. 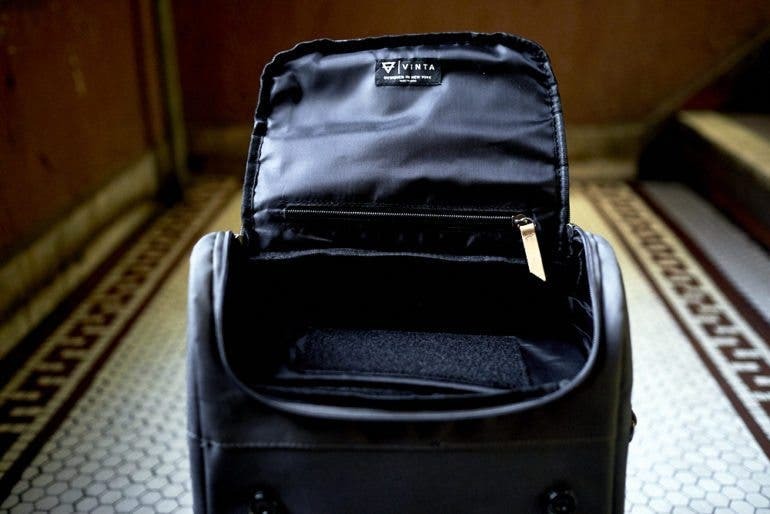 Inside this compartment you’ll also see a padded sleeve for a 15-inch laptop or a tablet. You can certainly carry a lot of gear with you, and the great thing is that, unless you strap a tripod to the side, people really won’t know that you are carrying camera gear with you, which is perfect for when you in an urban environment. Drawing less attention to yourself when you’re carrying so much is a good thing. The backpack is weather sealed and does a fantastic job of keeping your belongings dry. We used the Tenba DNA 15 in heavy snow, torrential rains, blustering winds, and banged it around on planes and the subway system; it still looks like new. The Tenba DNA 15 is comfortable to carry. The straps are padded really well, the chest and waist straps keep the bag nice and snug against your body, and when positioned right the lumbar support at the bottom of the bag offers great support. 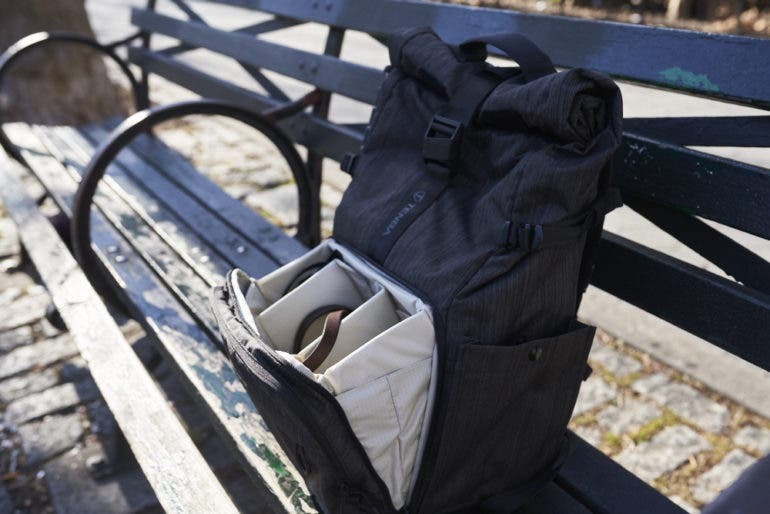 The Tenba DNA 15 will suit city dwellers really well. It’s well built, holds a ton of gear, and when out in the elements you can be safe in the knowledge that your gear will be kept dry. We definitely recommend you check out this camera backpack from Tenba. Pro Tip: If you want to keep your accessories neat, tidy, and organized this small accessory bag from Tenba is the perfect way to do it. 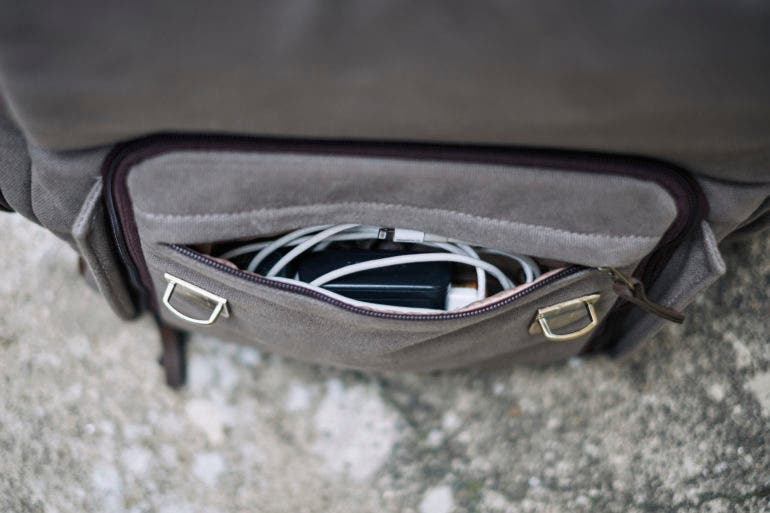 You can keep batteries, cables, memory cards, chargers, and more in this bag. You’ll always know exactly where your stuff is. 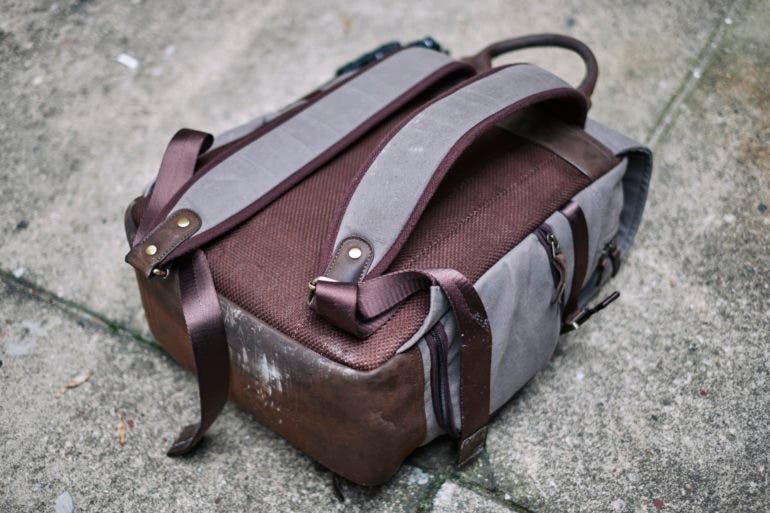 The second bag on our list is another roll top style bag, but this time it’s from WANDRD. The PRVKE 21 is a smaller, thinner version of the original WANDRD PRVKE, which is perfect for use in a bustling city. This bag has a minimalist design, is weather sealed, and despite its smaller size, it can still have quite a bit of gear crammed inside it. The PRVKE is capable of carrying a fair bit of gear which, given that this is a smaller variant of the bag, is quite impressive. 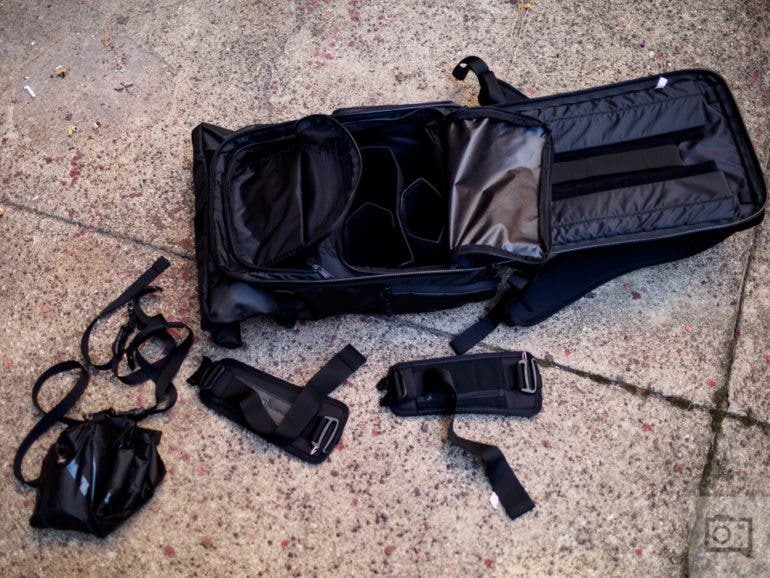 In the bottom compartment of the bag you’ll be able to stash a Mirrorless or Crop sensor body and anywhere from three to four lenses, or if you pack a Full Frame DSLR you’ll be able to bring along two to three lenses. The top compartment of the bag is great in that you can roll or unroll the bag to accommodate more or less stuff. Need to pack a change of clothes? Great, you can do that, Need more space for gear? You can use the top compartment for this too. 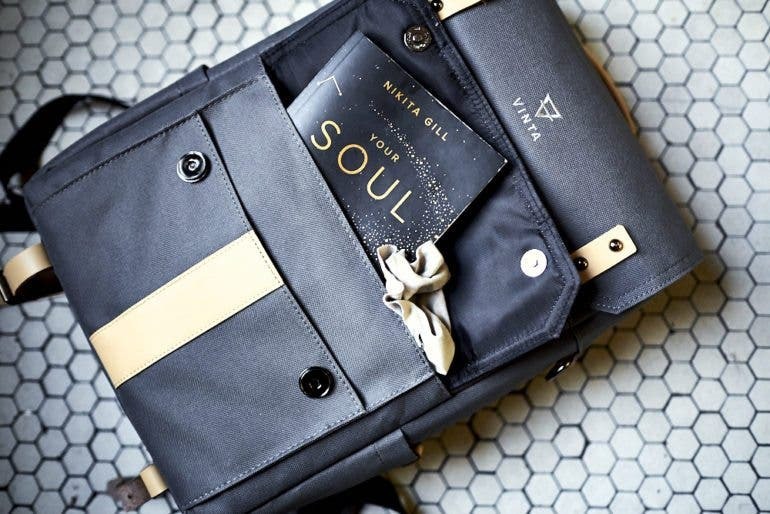 You’ll also find a padded sleeve for a 15-inch laptop and an iPad Pro, and there’s even a zippered compartment on the back of the bag where you can store a passport, wallet, or another small valuable. The great thing with this is that it’s always against your back. You can get quick access to your gear in the bottom compartment thanks to a side access panel, and there is a compartment on the opposing side where you can store a water bottle or tripod. This camera backpack is also incredibly comfortable thanks to the molded padding on the back of the bag and on the straps. There is a waist strap which can help keep the bag secure against your body, but it can be removed if you don’t need it. The bag is weather sealed and features weather-resistant zippers and tarpaulin. The materials used in its construction give the bag a unique look, but it’s also incredibly durable and will last a while. The slim profile makes it easy to carry around in crowded areas, and it can carry a lot of gear. 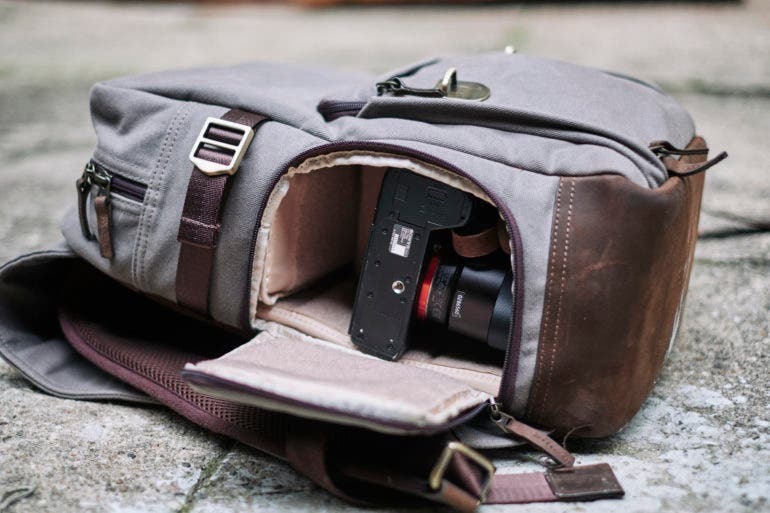 When it comes to camera bags for city dwelling photographers, the WANDRD 21L is a great choice. Pro Tip: Cameras and lenses get dirty so you should always keep a basic camera and lens cleaning kit in your bag. This inexpensive kit has everything you need to keep you gear in tip top shape. 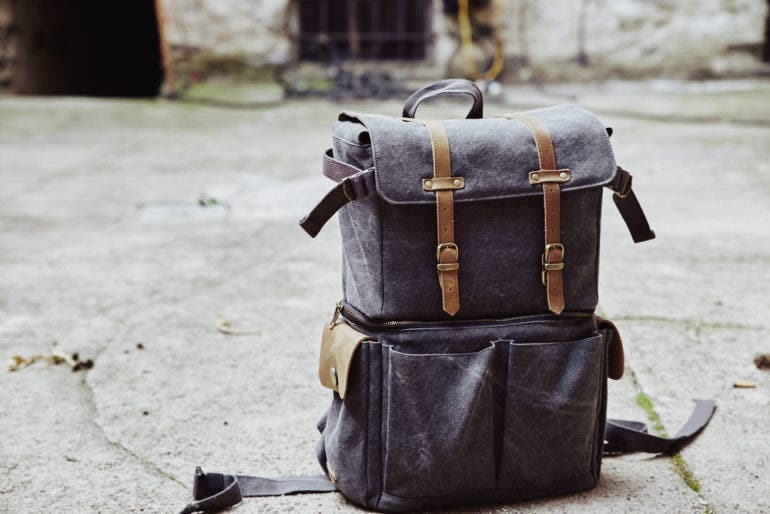 There’s no doubt: Portage Supply Co. make some truly amazing bags. 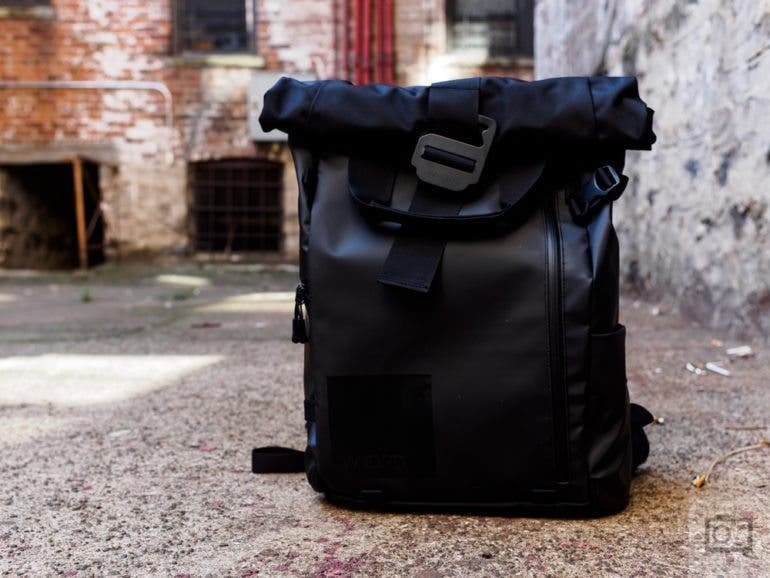 We have been impressed with their offerings in the past, and we are just as impressed with one of their latest bags, the Portage Supply Kenora camera backpack. This beauty is beautifully made, is super comfortable to wear, and the price is mind blowing. 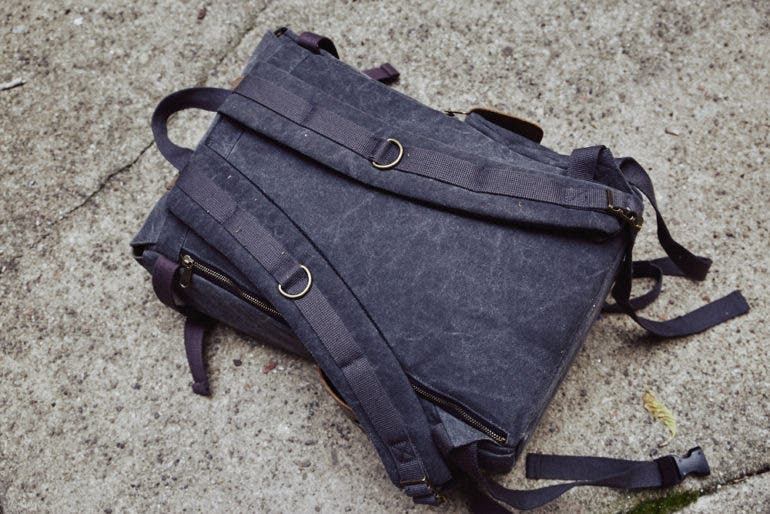 This bag from Portage Supply Co. really does have it all. The bag is made out of leather and canvas which is nice and soft. It’s also water resistant. While it’s not as weather sealed as some of the other bags on this list, it’s protected enough to be fine in a light rain. 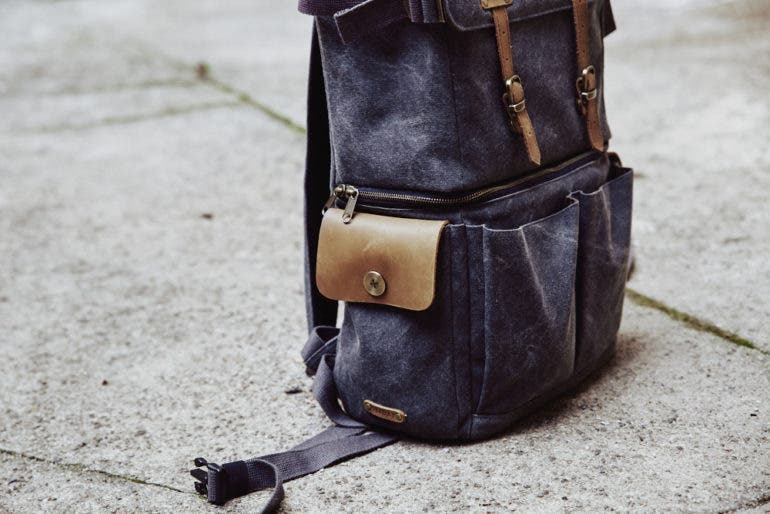 The bag is adorned with high quality zippers and brass hardware which gives it a good look. There is a small zipped compartment on the top flap which is handy for cleaning cloths or keys. 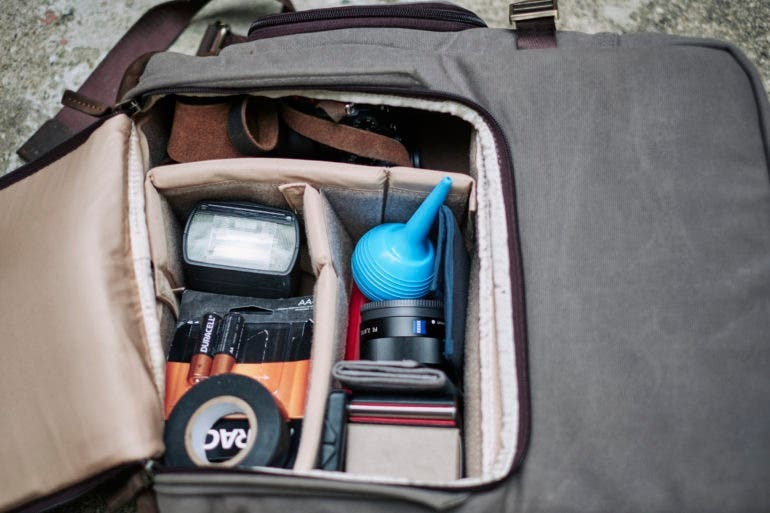 The main compartment of the bag is big enough to store a few lenses, a flash, batteries, and other accessories. You won’t be able to store as much equipment in here as you can in some of the other bags, so this bag is for those who like to travel light. The camera gets housed in a compartment that is accessed through the side of the bag, which is a nice feature as it gives you quick access to your cameras. There’s enough space in there to leave a lens attached too. The top compartment of the bag is a decent size, and is the perfect place to store filters and other accessories. The Kenora is ridiculously comfortable to carry around; in fact we think it may be the most perfectly balanced bag we’ve tested. Even when a tripod is sitting in the side pocket, the backpack stays in place and doesn’t shift around. The straps are to thank for this; they do a fantastic job. If you want a smaller camera backpack and really don’t want to spend a lot, the Kenora from Portage Supply is the bag for you. Pro Tip: When you head out on a shoot you never know what the weather is going to do. Keep some camera and lens weather proof covers in your camera bag so that you can keep on shooting regardless of what mother nature is doing. The affordable leather and canvas Oliday Journeyman is not only stunning to look at, the amount of gear this bag can hold will stun you too. It’s built to withstand anything thrown at it, and it looks great! The Journeyman will have you asking how Oliday can sell a bag this good for such a low price. When it comes to gear, the Journeyman can easily hold a DSLR or Mirrorless camera along with five to six lenses. There also plenty of space for various accessories. If, for some reason, you don’t want to carry your camera gear with you (do people really do that?) the Journeyman can be turned into a regular backpack which can carry clothes and other boring stuff; you just have to remove the dividers. The main compartment is secured by two magnetic straps. Open the bag up and you’ll see a very generously padded interior where you can place your camera, lenses, and other accessories. There’s enough space here to hold a DSLR and up to six lenses. 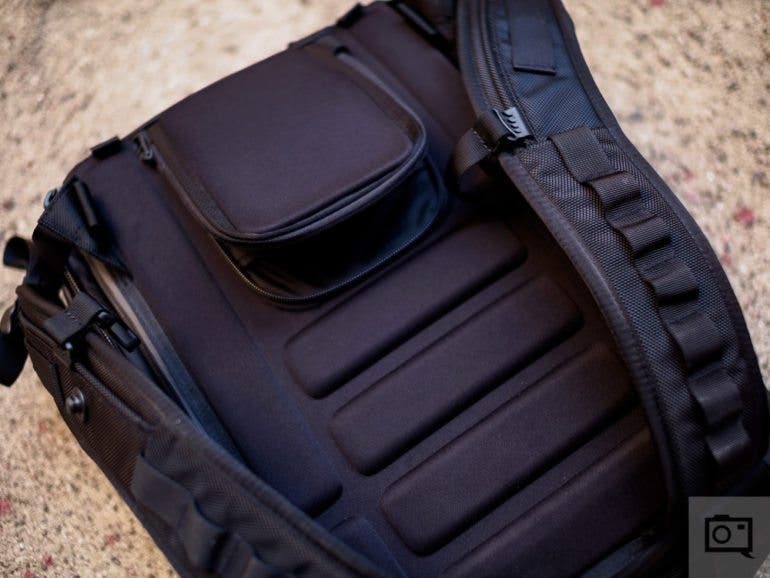 There’s a padded sleeve where you can house a 15-inch laptop, and on the sides you’ll find two pockets where you can keep various small items. 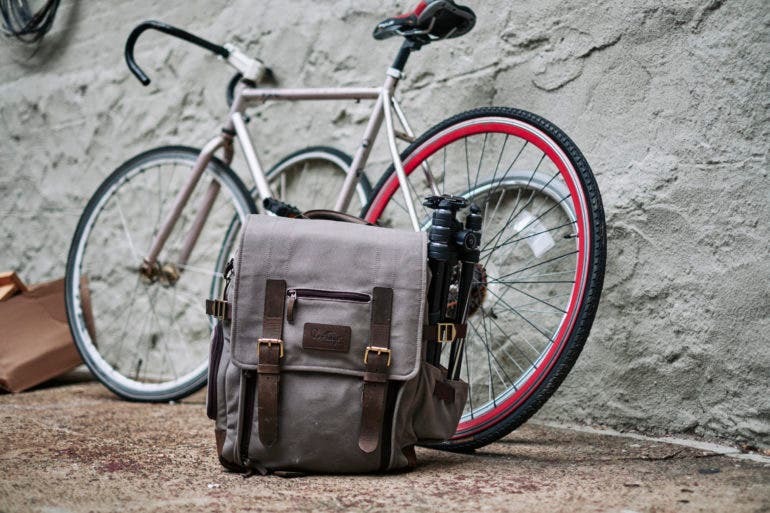 This camera bag is made out of heavy duty, 14oz cotton and 100% full grain leather. 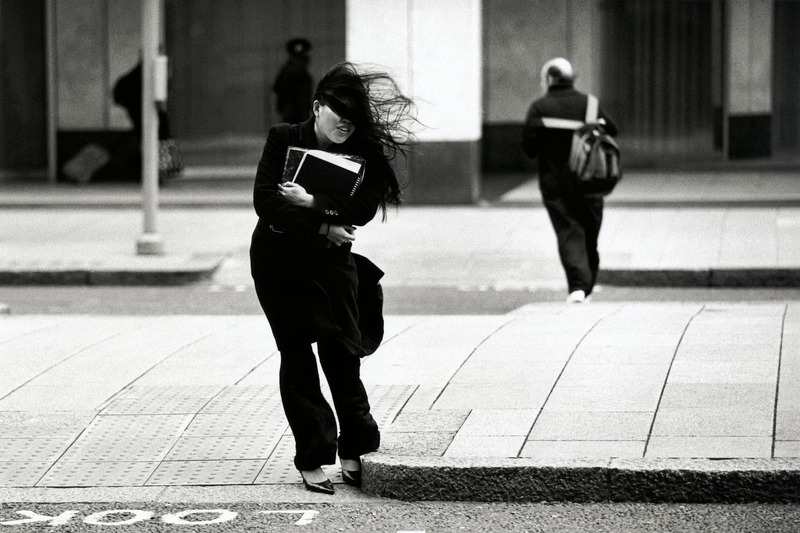 The canvas is coated with a polyurethane on the inner side to make it resistant to rain and snow. Solid brass accents and hardware give it a classic look, while the soft leather feels smooth to the touch. This bag looks and feels like one that should cost twice as much, if not more. Like the other camera backpacks listed here, this bag is really comfortable to carry around. The shoulder straps are well padded, and the padded back provides good comfort when the bag is loaded down. The overall build quality of this bag is great and the weather sealing is excellent. Rain, sleet, hail, and snow, this bag laughs in the face of all of them. It’s tough too. We took it on a subway and tossed it around on planes, and the bag is just like new. Bags don’t often wow us as much as the Oliday Journeyman has. It’s a well designed camera backpack that will last a city dweller a long time. Pro Tip: Your camera bag has plenty of storage space for SD cards, and it’s always a good idea to make sure that space is filled with enough of these plastic marvels. SD cards can, and do fail so make sure you have enough with you in case the worst happens. 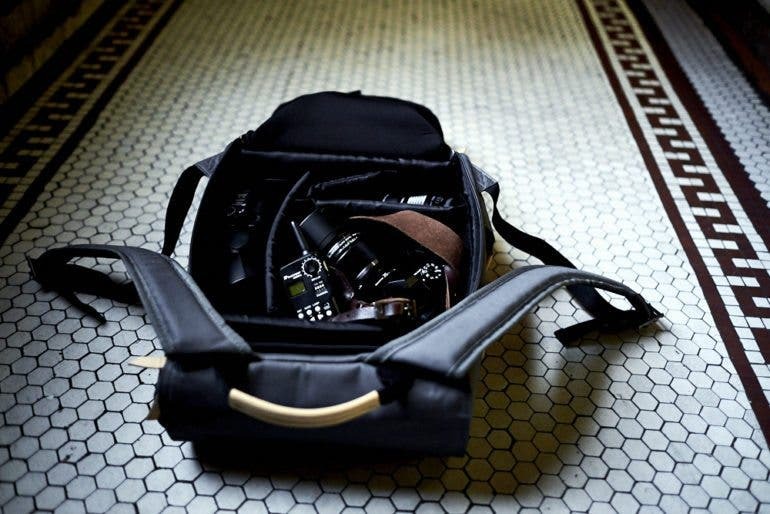 The Vinta S is a seriously stylish camera backpack that can carry a fair amount of gear. 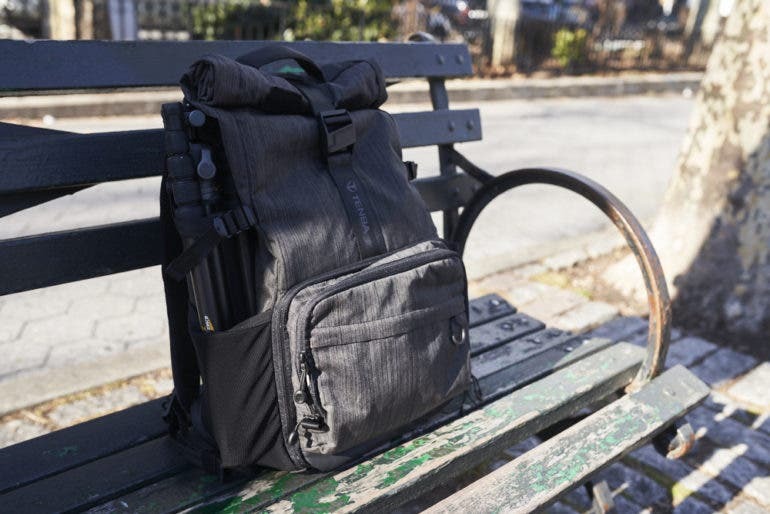 This backpack is well built, and it’s small size makes it perfect for a city dwellers. Its place on our list is well deserved. Why we do love the Vinta S so much? This camera backpack can hold copious amounts of gear, yet it’s small enough for someone who lives in a busy, cramped city. A Full Frame DSLR can fit in here with three to five lenses, and a Mirrorless camera along with four to six lenses can work too. There’s a dedicated slot for a 15-inch laptop or tablet, and there’s more than enough space for accessories too. The front pocket is secured with magnetic clasps. Inside there are three compartments that can hold small items, and there is enough room for a book or notepad. On the sides there are two very tight pockets which can hold business cards, but not much else, and the tripod is held to the bag via straps on the bottom of the bag. Like the Tenba DNA 15, the Vinta S does not in any way look like a camera backpack, which is just fine with us. As stated above, the less attention you bring to yourself when carrying so much gear, the better. 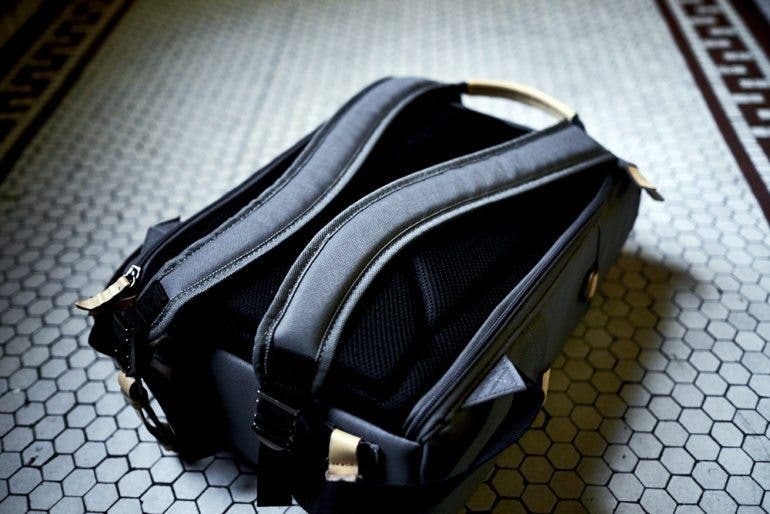 The Vinta S also has the most comfortable straps on any bag we’ve tested. The padding is super soft and they make carrying this bag a joy! The canvas and leather is nice to the touch and very durable. It’s also weather sealed. We took the bag out into the rain and it kept everything completely dry. If you want a low profile bag that looks great, holds a lot of gear, and is weather sealed, the Vinta S might just be the camera backpack for you.